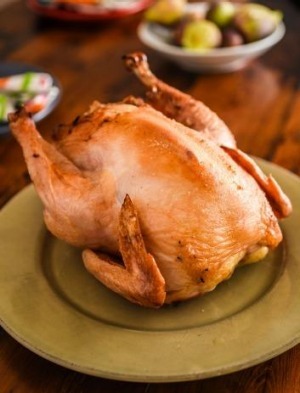 Would you pay $40 for a chook you have to cook yourself? Can you taste the difference? We'll come to that, but first let's head for Mirboo North, rich dairy country in the Strzelecki Ranges. It's about 150 kilometres east of Melbourne and remains green year-round, except in the driest of years. This is where you'll find Ilan Goldman's farm, and where the only sound you hear above the trickling water in his creek is the contented clucking of chickens. These are no average chickens. They are specially bred for Australian outdoor growing conditions, and if you would like to roast one for your dinner, it will cost you about $40. "Almost every meat chicken in Australia, including the organic and free-range chickens, comes from just two breeds," says Goldman. "Ross and Cobb." He refers to the two breeds raised for industrial meat production. Cobb is a bird bred by a global company called Cobb-Vantress. Their company's stated aim is to use "innovative research and technology to make protein available, healthy and affordable worldwide." One of the company's distributors in Australia is Baiada, which sells chickens under the Steggles and Lilydale brands. The Ross breed is owned by a German company called EW Group. These chickens are remarkably efficient at converting the feed they eat into the muscle we eat. From hatching from their egg to slaughter takes just 42 days. Goldman's chickens do not free-range but they do forage and graze on the rich green pasture. They are housed inside lightweight mobile chicken pens made from PVC pipe and chicken wire. Goldman's design was directly inspired by US alternative food advocate and self-professed "lunatic farmer" Joel Salatin, a staunch opponent of the industrial food system. Every few days, Goldman moves the mobile pens, dubbed "chicken tractors" by Salatin, to give the birds fresh grass and access to scratch the bugs and worms dwelling beneath. I pull out my camera to take a photo and the group of 20 or so chickens shy away. Then, one by one, they start to come forward. They are unusual looking birds, a ragtag motley crew of speckled birds, some greyish, others lacking feathers on their necks. "That is a throwback to the Transylvanian Naked Necks," explains Goldman. His chickens were bred in New South Wales by Michael "Chookie" Sommerlad. He's changing the face of the chicken industry by taking old breeds such as the Australian Game chicken, introduced into Australia from Malaysia in the mid 1800s, and the Naked Neck, originally from Transylvania, and cross breeding them. These are birds with their foraging instincts well intact and some, like the Naked Neck, can handle hot conditions. The new breeds have names like Homesteader, Traditional Table and Gourmet Slow Grow. Goldman has a mixed flock of different breeds that he buys as day-old chickens that are air-freighted from Sydney. These birds are different to most chooks I have come across. Not only do they look different, especially the ones without the feathers on their neck, but they are more alert, more active, more inquisitive. While they contentedly scratch about the grass they feed mainly on a blend of wheat, camelina meal, meat, fish and soy meal that Goldman blends himself on the farm. Here he grows them out for 84 days, just under double the time taken to raise your average supermarket bird. They weigh about two kilograms dressed and cost about $20 a kilogram. "There's a lot of feed and a lot of labour in raising birds like this," says Goldman. I bought two birds from Mirboo Pastured Poultry. The meat has a stronger flavour than industrial chicken but is not gamey, like pheasant. The flesh is noticeably darker and there is obvious definition between the muscles. Although the bones are thick, strong and heavy, there is still a great deal of recoverable flesh. We roasted one bird and it was remarkably good, producing a lot of juices that made brilliant gravy. It fed a family of four with enough meat left over for chicken sandwiches one day, chicken coleslaw the next and the carcass was used again to make stock for soup. That is four meals from one bird. The other bird was used to make coq au vin, the best I have made. The flavour was of fowl in a rich sauce, not just onion and red wine. It fed eight hungry people with enough left over for another two serves. This is some the best chicken I have seen in Australia. Sommerlad-bred chickens are also available in NSW, WA and Queensland. See sommerladspoultry.com.au for producers.